Yakuza and vampires depend on carefully balanced ecosystems that are not so different from Social Security. There absolutely must be more people bleeding money and plasma into the system than sucking it out. 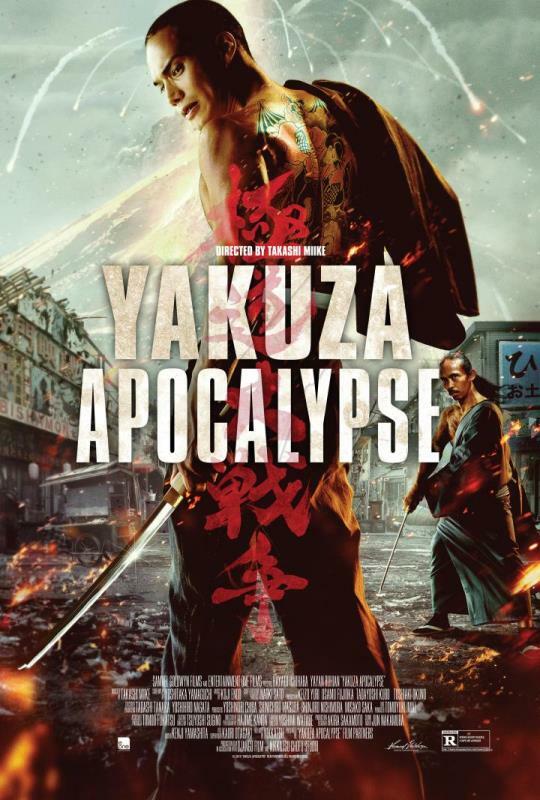 Due to his inexperience, a freshly turned Yakuza vampire threatens to upset the long term equilibrium, but he will have more pressing concerns when three agents of doomsday start wreaking cosmic havoc in Takashi Miike’s Yakuza Apocalypse (trailer here), which opens tomorrow in New York. Genyō Kamiura is a benevolent Yakuza boss and a vampire, who refuses to drink civilian blood, even though it is sweeter and more nourishing than the bitter swill running through Yakuza veins. He has taken earnest Akira Kageyama under his wing, even though the lad’s skin is too sensitive to tattoo. They see eye to eye when it comes to giving civilians a fair shake, so when Kamiura is fatally jumped by Kyoken, a martial arts maniac and his boss, a Spanish priest carrying a disintegration ray in a casket, the last thing his severed head does is turn Kageyama into a vampire. Unfortunately, the unprepared Kageyama then accidentally turns a civilian, who immediately turns another, and so on. Soon nearly the entire town consists of vampires sporting supernatural Yakuza tats. Obviously things are a mess, but they will only get worse with the arrival of the third representative of the cosmic syndicate. Kaeru-kun might look like a guy in a fuzzy green frog costume, but he is as lethal as the Stay-Puft Marshmallow Man. What part of this being a Miike film didn’t you get? Yakupoc has been dismissed as a Miike greatest hits package and there is a kernel of truth in that. One might have thought he worked through all his Django riffs in Sukiyaki Western Django, but apparently not. However, Miike is such a gleefully kitchen sink kind of filmmaker he constantly throws in inspired bits where you least expect them. Indeed, the audience’s introduction to Kamiura, in which a small army of earthly Yakuza learn the folly of trying to whack a vampire is truly vintage Miike. There are also a number of wonderfully droll lines sprinkled throughout the film and without question, it features some of the best fight choreography ever conceived for a dude in a downy soft animal costume. Hayato Ichihara is shockingly engaging portraying Kageyama’s maturation process from awestruck henchman to hardnosed vampire. Largely playing against his usual hound dog type, Lily Franky is off the hook awesome as Kamiura. Unfortunately, Yayan Ruhian (the unrelated Mad Dogs in the Raid films) does have much of a character to work with in Kyoken, or much room to chew scenery. At least he still has all kinds of moves. The rest of the Yakuza underlings largely blur together. When Miike is working in his chaotic one-upsman bag, his films are sort of like the weather. If it isn’t working for you, just wait ten minutes and it will change. Yet, even it clicks in fits and starts, it is exhilarating to watch him embrace the bedlam. His prolific work ethic is also pretty darn impressive. 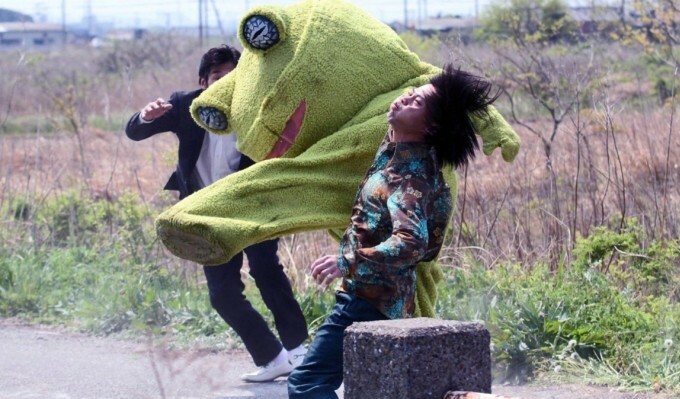 Recommended for Miike fans, but maybe not the best starter film for the uninitiated, Yakuza Apocalypse opens tomorrow (10/9) in New York, at the Village East.